Sunga was raised on a diet of musical theater, 70s folk revival, funk and the Beatles. In other words, she has been genre-confused since childhood. Then she heard Mildred Bailey and her life was changed forever. Since then she has immersed herself in the music, fashion, and culture of the Jazz Age. Major influences are the aforementioned Miss Bailey, Lee Morse, Annette Hanshaw, Connee Boswell, Ruth Etting, Bing Crosby, and the wonderful Cliff Edwards (aka Ukulele Ike). These days she is thrilled to be strumming her beautiful Paddlele made by Joel Eckhaus of Earnest Instruments. 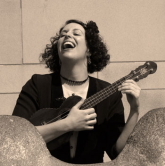 She also has a vintage 1930s concert ukulele by Echo-Uke.